Open – Tuesday, April 28th at 12:00 AM ET to Friday, May 1st at 11:59 PM ET. Ten (10) winners will receive will receive a large 1-800-Flowers arrangement to be delivered to the address of their choice. 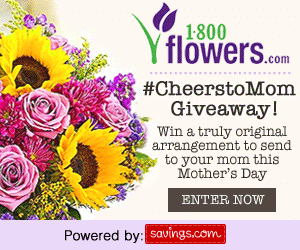 Enter the giveaway by heading to the 1-800-Flowers page on Savings.com and submit your email address on the form at the top of the page. The winners will be chosen through a lottery drawing and notified on Monday (5/4) via the email address they used to enter. Once notified on Monday (5/4), winners will then have 24 hours to complete a winner information form with all required delivery details to ensure on schedule delivery for Mother’s Day. See complete Official Rules for entry instructions, full prize descriptions, restrictions and other important details. I’d love to be the recipient of that plant above. I love flowers, but plants last much longer. Saving money on Mother’s Day Gifts and Flowers is money in your pocket. **Disclosure – this is a sponsored post. All opinions are those of a FCS team member. Should you click on any of the links, the team member may receive a small commission. Aren’t those lockets just adorable? Full of color – they can be worn with most any outfit. The sayings are adorable. The charms float. You can buy other charms to change them out if you’d like a change. And, since the lockets aren’t huge – they will be attractive on the neckline. That said, Mother’s Day comes once a year and is approaching upon us fast. For those who give gifts to their Mom, Grandma, or that special woman in their life – it’s often the same old thing – flowers or plants of some sort. I know my ex is famous for giving rose bushes year, after, year. This year, why not give your “special” mom something different? Something that they can wear close to their heart and treasure the rest of their lives. A Touch of Dazzle’s Locket Pendants would make the perfect gift. They have beautiful lockets for the Mom, Grandma, or that special lady in your life you treasure like a mother. Each locket is made of high quality stainless steel and is all-inclusive: locket, plate, charms, crystal, chains and gift box. Touch of Dazzle’s Lockets float on a stainless steel rolo chain & ball necklace. The pendants are easy to open and close as they are magnetic. A Touch of Dazzle is an established brand registered jewelry store on Amazon.com. We have an extraordinarily high level of customer service – we truly believe the customer is always right. We only sell the best quality at truly incredible prices. How can we do that? We have absolutely no middlemen. We design and manufacture all of our own jewelry, package and ship it directly to the Amazon warehouses and offer it to the public at prices that most companies sell to their wholesale customers. A Touch of Dazzle’s Pocket Pendants are available at Amazon.com. And, exclusively for readers of Finger Click Saver, you can save 10% off Mother’s Day Pendants using the promo code YD7A6LTM at checkout. Prime members get free 2-day shipping. In reading the reviews on these lockets, they come with a 4+ star rating. There’s something to be said for that. In addition to the Touch of Dazzle locket pendants, a Touch of Dazzle offers a lot more. You’ll find earrings, bracelets, rings, and other pendants within their assortment of products. Myself, I would be very happy to receive the KitchenAid Ultra Power Tilt-Head Stand Mixer and the Samsung 22″ LED HDTV that you see on the idea lists below. *This post contains affiliate links and a team member of FCS may earn commission if you click on one of the links. Dress Mom up this Mother’s Day (May 11, 2014) with a shirt from CustomInk. CustomInk has a multitude of designs and ideas just waiting for you to customize that shirt for that Mom in your life. Check out all of CustomInk’s Mother’s Day ideas and start designing her shirt today!